The Agency Performance and Accountability Commission met this week at the state Capitol to brief lawmakers on the results of their agency audits. The sessions were closed to the public. A commission appointed by state leaders to ferret out wasteful spending and ineffective practices by state agencies has gotten its first recommendations from private auditors it hired. But if a summary of 61 draft proposals obtained by Oklahoma Watch is any indication, auditors aren’t pushing for major cutbacks in staffing or programs to shrink state government. Instead, the initial audit of six agencies mostly recommended changes in processes or procedures that have no budgetary impact or require no legislative action, the proposals show. Some ideas would require additional funds or employees; others would yield millions of dollars in additional revenue. An example is having the Oklahoma Tax Commission conduct a “tax gap study,” looking to collect more from taxpayers who fail to pay taxes they owe. Expected return: between $61 million and $287 million. Other proposed changes include releasing more inmates who are eligible for parole; initially building seven, instead of nine, residential cottages for juvenile offenders; removing child support services from the District Attorneys Council; improving communications systems for state troopers, costing up to $37 million for new towers; and requiring the Office of Management and Enterprise Services to increase cyber security for state government. It’s unclear how these types of changes would fit into Gov. Kevin Stitt’s efforts to bring more accountability and efficiency to state government – one of his main campaign promises. The Agency Performance and Accountability Commission, created last year, was tasked with finding ideas to make delivery of government services more efficient. The commission declined to release the proposals. 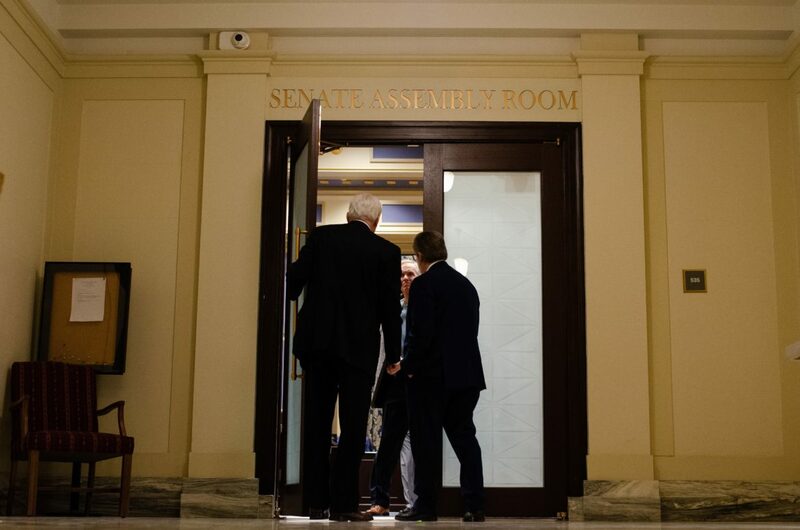 Some of the group of nine business leaders met with some lawmakers behind closed doors on Wednesday to brief them on the audits and allow for questions to auditors. According to emails obtained by Oklahoma Watch, the commission initially intended to hold public meetings with agency heads, but abruptly reversed course and held the private meetings instead, giving no reasons. Agency heads were told not to attend. “There was a little give and take (at the meeting), but we hope to write up the commission’s recommendations and release them to the public in the next couple of weeks,” said Tulsa oilman Bob Sullivan, who chairs the commission. The audits were completed Dec. 31. Commission members met with legislative leaders in small groups on Wednesday and Thursday to avoid triggering requirements of the Open Meeting Act. Sullivan said some minor corrections are still being made and the audits weren’t final. Oklahoma Watch filed open records requests with the six agencies for the audits, but the agencies either deferred release to the commission or said their copies couldn’t be released until finalized. A spokeswoman for the Attorney General Mike Hunter said the closed-door briefings were legal as long as quorum wasn’t present and no final actions were taken. The commission spent more than $1.3 million for performance audits at the Department of Corrections, District Attorneys Council, Department of Public Safety, Office of Management and Enterprise Services, Oklahoma Tax Commission and Office of Juvenile Affairs. The contracts were awarded to four audit firms: Alvarez & Marsal, KPMG, PFM Group Consulting and BKD. The 2018 law creating the accountability committee calls for auditors to examine additional agencies this year, although a request for proposal has not been released. The commission received $2 million in funding last year for the first batch of audits. Under the law, agencies must follow the committee’s recommendations or explain why they won’t. The commission’s work last year was delayed by several missteps related to open meeting and state bidding requirements. That put the outside auditors under a tight timeline to finish audits of the six agencies. The 12-page summary of proposals contains no sweeping reforms or dramatic cutbacks in spending at the six audited agencies. Some recommendations have projected costs or savings; most have neither. It’s unknown, however, if the auditors recommended only the 61 changes in the summary or those proposals were chosen as highlights to present to the commission. The list refers to specific pages in a full audit report for more details about requirements. Among the recommendations for the Department of Corrections are salary increases for corrections officers, costing $19 million, which the agency has long sought, and retroactively applying State Question 780, which reclassified certain felony crimes as misdemeanors. A bipartisan House bill introduced this session would make SQ 780 retroactive, reducing prison time for those convicted before the measure took effect in July 2017. Other highlights include requiring Department of Public Safety contractors to pay a fee of up to 12 percent to help cover agency overhead; mandating electronic filing for corporate tax returns, and finding a cost-efficient way to provide health-care coverage to juveniles in state custody. Most of the rest deal with technical or internal activities or changes to human resources or management processes. DPS Commissioner Rusty Rhoades said the commission’s audit was one of three done at the agency in the past year. He asked the state auditor to conduct an operational audit when he took over in November 2017 and the agency also has an annual financial audit. Meanwhile, Senate President Pro Tem Greg Treat, R-Oklahoma City, has filed Senate Bill 1, which would create a Legislative Office of Financial Transparency. The office would review agency programs and give more financial information to legislative leaders during budget negotiations. A small group of unelected citizens, all appointed by Republican state leaders, will soon be exercising significant powers to decide how the state’s top agencies spend their funding and which services they should provide. Will it have a political agenda or be independent?